Help children develop the language and thinking skills that they need for success in the classroom literacy curriculum using the practical strategies in this book. Topics covered include teaching literacy-related language concepts, developing language strategies that facilitate literacy acquisition, building phonological awareness, helping bilingual children with reading disabilities, and implementing language-based programs of instruction. 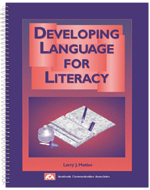 Practical guidelines for using the child's knowledge of language to facilitate literacy acquisition are included.